One in six American children was affected by obesity in 2000. In the city of Somerville, outside of Boston, 46 percent of Somerville first and third graders were overweight or at risk for becoming so. Dr. Christina Economos, an associate professor at the Friedman School of Nutrition and the School of Medicine at Tufts University worked with her colleagues in collaboration with the entire City of Somerville to design and implement Shape Up Somerville (SUS). Recognizing that children have limited control over the food and physical activity options available to them, the program sought to prevent obesity in early elementary school-age children through a community-wide initiative focused on environmental and policy strategies to impact energy balance. Over the 2003-2004 and 2004-2005 school years, Shape Up Somerville led to a statistically significant drop in Body Mass Index (BMI) among early elementary school children. As of 2012, Shape Up Somerville is part of the Somerville Health Department and an integral part of community efforts to improve healthy and active lifestyle options for the community. Christina implemented Shape Up Somerville as a collaborative effort because of her appreciation and experience with the non-profit, public and private sectors. With a PhD in nutrition, she then spent two years in the public sector working for the Massachusetts Department of Public Health, before moving to academia. Christina now devotes her time to ensuring that academic research makes its way into public health improvements, and vice versa. Christina’s parents had a “don’t say no attitude,” and pushed her toward engaging in her community. Her parents encouraged her to pursue her childhood dream of working in science, and she balances this drive to research with the desire to make an impact on society. Aware that her calling was to prevent, and not merely to treat, Christina transforms communities through public health research. Christina pursued a Bachelors in Cardiopulmonary Science and Biology and a Masters in Applied Physiology and Nutrition. She cites an ability to grasp an array of salient factors when designing a nutrition intervention, such as including “activity before-, during-, and after- school and engaging innovative and forward thinking leaders.” This holistic approach, combined with a Doctorate in Nutritional Science and her professional background in public health, gave her a scientifically valid insight into the obesity epidemic and the experience and skills necessary to implement a public program. Working at the United States Department of Agriculture’s Human Nutrition Research Center on Aging and as a member of food-policy advisory councils, gave Christina understanding into the varying constraints and practices of each sector. 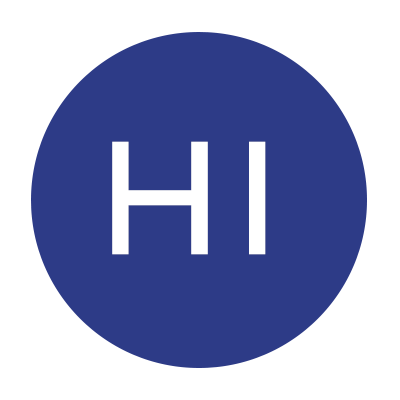 As a consultant at Harvard Business School’s Executive Education program, she worked with CEOs, learning from their efforts at self-betterment and integrating that information to develop her own strategic thinking. During her years in the public sector, Christina worked intensively with experts and practitioners from all sectors, who gave her multiple perspectives on nutrition and activity. These experts became a valuable resource; Her network included physicians, leadership at the state and federal level, and public health practitioners. Christina’s academic training in both quantitative and qualitative methods gave her a systematic approach to data collection and analysis, allowing her to research obesity rates and interview the community. Her consulting background developed her listening skills and provided her with the understanding to develop this solutions-oriented strategy. She determined that change wouldn’t happen from working with academics alone; her cross-sector background guided her towards designing interventions that directly responded to the needs of communities. Christina and her team conducted a series of focus groups and key-informant interviews with children, parents, teachers, and community members, getting critical feedback on appropriate approaches to combating childhood obesity. The creation of the SUS Advisory Council (now called Taskforce) allowed researchers to meet monthly to provide project updates, coordinate collaborative grants, and measure outcomes. This process brought researchers, school personnel, community and immigrant service providers, and volunteer health advisors onto the same page. Rather than creating a public mandate, involving constituents and community members allowed for greater input. Christina foresaw that the most time-consuming part of the collaboration would be building trust between stakeholders. She therefore created several Memoranda of Understanding, listing the commitments and responsibilities of each participant. Christina led by example, vowing to make the project sustainable even after her study was completed. To ensure this continuance of activities and staff, Christina applied for and received a $1 million, three-year grant from the PepsiCo Foundation to help sustain and expand SUS. She likewise committed to ongoing letters of support for other community grants and continued research in the community with hard to reach populations like new immigrants and families with very young children. Each sector implemented SUS’s agenda through existing channels. Schools changed curriculum and food options, providing physical activity options for before, during, and after school time, and revitalized school food by providing healthier meals and snacks, reducing the number of dessert options, and including more fresh produce. Private businesses and citizens showed public support for these changes; local farmers donated fresh produce for the improved school lunches. Non-profits helped SUS extend its reach to parents and community outreach in multiple languages; the Massachusetts Alliance for Portuguese Speakers, for example, provided bilingual pamphlets stating SUS’s activities and goals. Somerville’s Mayor, Joseph A. Curtatone, championed Shape Up Somerville and publicized its success. The Mayor’s unwavering commitment to the project, including eating at SUS approved restaurants and participating in SUS community events, encouraged visibility and support from other champions in the community. Working from established ties, these champions leant external legitimacy to the initiative and encouraged others to follow in their path. 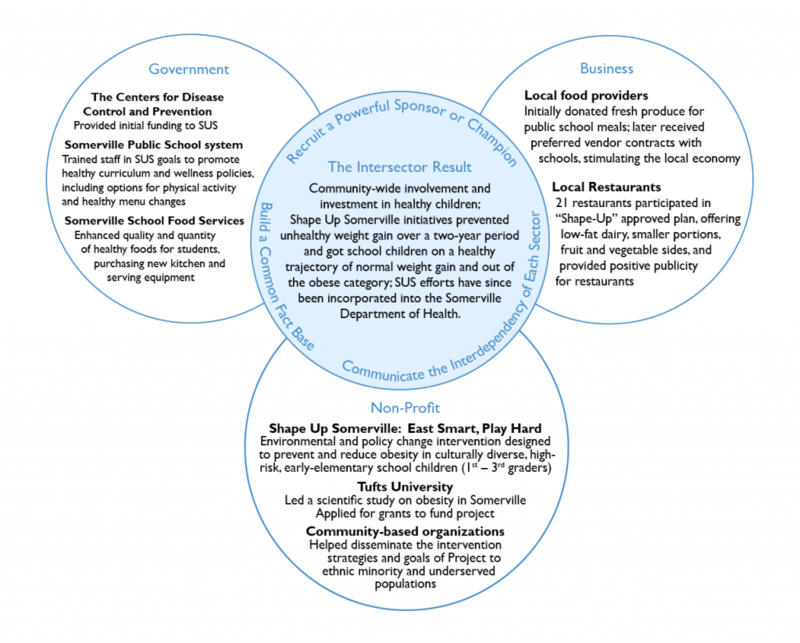 Shape Up Somerville evolved and expanded from a research study to a community-driven initiative, and resulted in a promising model to prevent childhood obesity. Over the 2003 -2004 and 2004-2005 school years, the intervention (including increased physical activity options available to children throughout the day, and the availability of healthy foods in the school, home and community environments) led to a statistically significant decline in BMI among early elementary school students. SUS has since developed into an umbrella initiative with a steering committee of about 40 organizational members who contribute to the city’s 20 year master planning process. With the support of city departments and Somerville public schools, Shape Up Somerville has had a lasting affect on the obesity problem. Among food service workers who participated in the study, 100 percent agreed that school lunch had improved since SUS’s inception. 90 teachers trained in the Healthy Eating and Active Time Club (HEAT), providing lessons on: increasing healthy food, decreasing consumption of high fat and sugar snacks, decreasing sedentary time and increasing physical activity. The $1 million PepsiCo Foundation Grant funded a SUS Coordinator in the community immediately post study period. SUS now has three positions in city government to support continued efforts, including the first Pedestrian/Bike Coordinator for the City to manage the extension of Somerville community paths and bike lanes. SUS has inspired policy change in areas of school wellness, contract negotiations to enhance food service, pedestrian safety, and employee fitness benefit. Christina’s next project, ChildObesity180.org scales up many aspects of SUS to the national level, building on the success of cross-sector collaboration to reverse childhood obesity across the country.